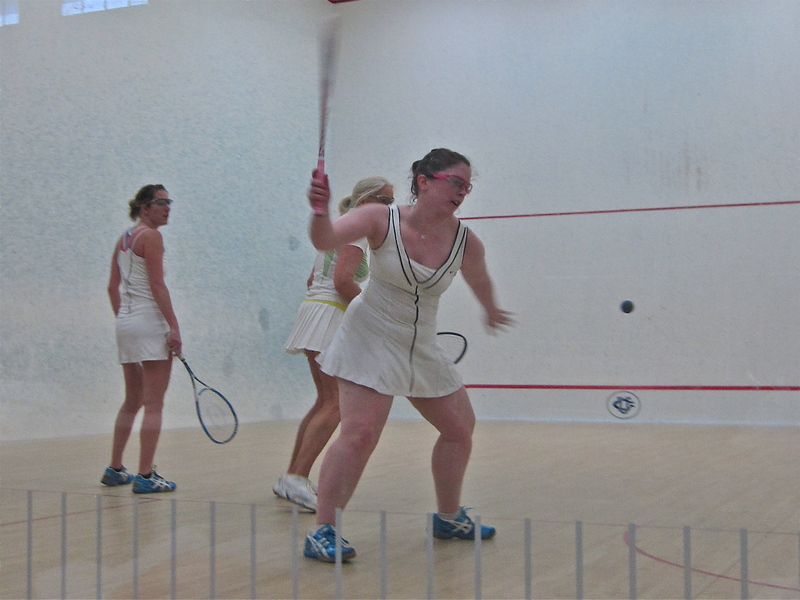 ← Could a Fashion Model Play Squash? Get Real. I admit it. I wasn’t psyched to play squash this past weekend. The weather in NYC over Mother’s Day was perfect. Sunny. High 70s. Sundresses and sandals were everywhere. 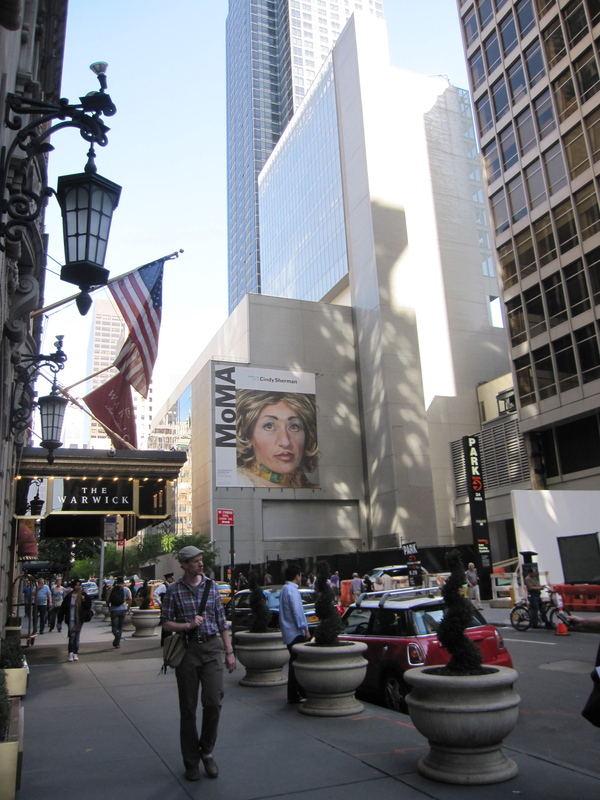 Not to mention tourist shorts and sneakers in mid-town, close to my Saturday and Sunday destination: the University Club on West 54th Street. Where I had to go inside . . . did I mention how unexcited I was? But then I met my pro partner for the Patricia Han Ladies Pro Am run along side the WDSA Turner Cup. She was standing outside the doubles court in a long black and white sundress and sandals and she greeted me with such sunshiny enthusiasm, that it was as if the blue sky outside had followed her in. 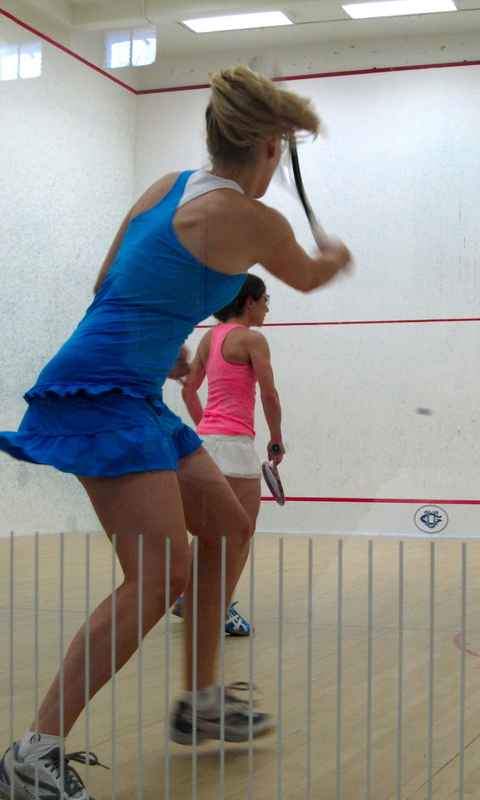 Adriana DiMauro is new to the women’s doubles tour, but not to squash; she coaches squash in Toronto where she is from, and it shows in the tremendous power she gets in her deadly reverse corners and tight low rails. We warmed up together (she switched her sundress for squash whites) and I was very thankful she was on my team. Not that the other team looked too easy to beat. It consisted of Pro Larissa Stephenson and Am Sarah Odell, who’s a lot less ‘am’ than I am, as one of the indefatigable organizers of this tournament, as well as many others. Yet, fatigued she and her teammate appeared at first; Sarah had played a match earlier in the day and then both played the first round of this event immediately before ours, due to some tight scheduling. Their racquets seemed not quite ready for Adriana’s fiery pace. We took the first game surprisingly quickly. One mustn’t rest on first game laurels, however, as I too often forget. While Larissa and Sarah regrouped (and refueled) between games, Adriana and I just decided to dole out more of the same. But that doesn’t work when your opponents don’t give the same. For the next two games, every time I let the ball get loose, they threw in a reverse corner and I was toast. They won games two and three, and soon it was time for my pro and I to regroup. Which I am happy to say that we did. It took us five games in all, but we prevailed. I’d like to say that it was due in part to my fleet feet, but I think it had more to do with my partner’s will to kill and our opponents’ more weary wiles. Whatever it was, it made spending a few hours inside a lot sunnier than I had thought it would be. Even our later loss that day to pro Dawn Gray and amateur Wendy Nolan was much more fun than painful. Many thanks to Dawn’s terrific sense of humor. I can’t attest that every pro-am match is as light-hearted–and it certainly wasn’t a walk in the park–but it didn’t make me wish I was sunbathing in Central Park. I could do that another day…..
Fortunately, you do not have to miss your sun bath in order to the watch the finals of the Turner Cup tonight. Pro Am Finals start at 4:30 and Turner Cup pro finals featuring Narelle Krizek & Suzie Pierrepont vs. Meredeth Quick & Stephanie Hewitt are scheduled for 6:30 p.m at the University Club in NYC. Both teams took down their semi-final opponents fairly quickly, so I’m expecting and hoping for a good nail-biting final match in which one of these teams rides off victorious into a New York City sunset. Until the LA Open, that is….but that’s a WDSA tour story for another day. 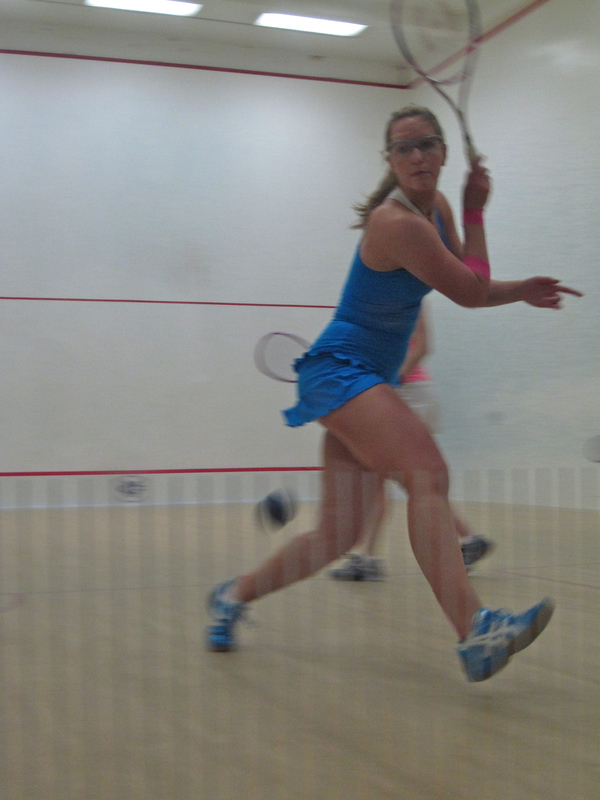 For an in depth account of the semi-finals, see Turner Cup Semis Recap at DailySquashReport. com. Finals update: Meredeth Quick & Stephanie Hewitt def. 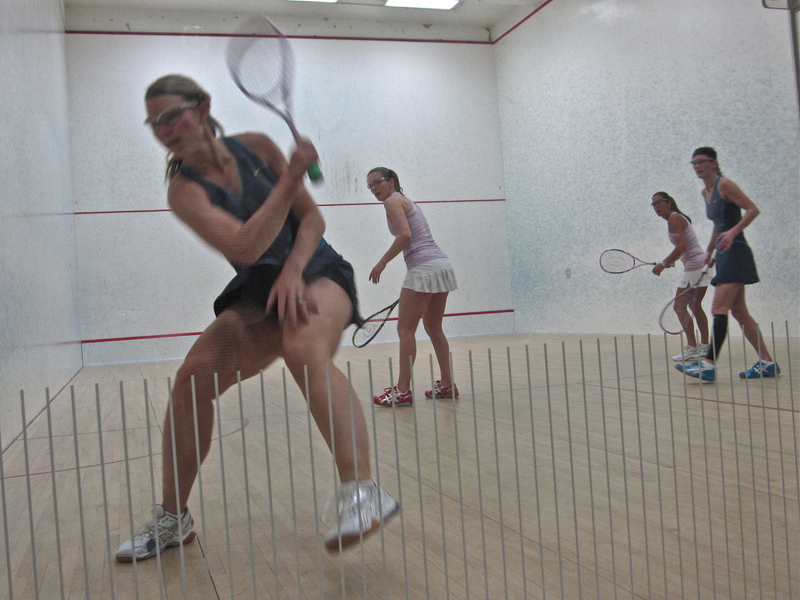 Narelle Krizek & Suzie Pierrepont in an exciting four game match. For a full recap see Final-Round Masterpiece For Quick And Hewitt at DailySquashReport.com.